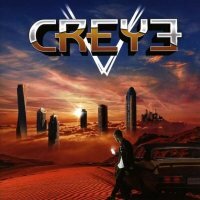 There has been a lot of expectation in various circles regarding the upcoming full-length album by new Swedish stars Creye, ever since their debut EP was released in 2017 to universal acclaim. With Frontiers picking them up for the release, that expectation has risen; therefore, the big question is, have they delivered? You bet they have! This album has been on constant repeat since I received my review copy and I can happily tell you that the band, which was formed by former Grand Slam guitarist Andreas Gullstrand, have produced an album full of eighties-inspired Melodic Rock. 'Holding On' kicks off this self-titled release with a marvellous keyboard intro before you hear vocalist Robin Jidhead for the first time; it's a new name to me, but following this performance, one I'm confident we'll hear more from. It's the perfect opening song with a great guitar solo and layered keys throughout. 'Nothing To Lose' follows suit and it's one of my standout tracks; it contains the lyrics, "Ignite the spark, feel the power", and this sums up the track perfectly. The album is extremely catchy and it follows a similar pattern of great keyboard-orientated Scandinavian Melodic Rock. Another standout is 'Miracle' which is slightly different because it's slower in pace and, dare I say it, a more mature sounding song that'll stick in your head all day. Every group should have a song named after a woman and Creye have gone for 'Christina', it's another favourite of mine featuring a wonderful introduction and a very catchy chorus where Jidhead sings like his life depends on it. There's only one real ballad on the album, 'Love Will Never Die', and if you hear a better power ballad this year, then please tell me about it. In total, there are thirteen tracks on this album, but every one of them is a winner and you'll definitely want to hit repeat and start again. Sweden has become a real hotbed of Melodic Rock in the last few years and you can now add Creye to the list of great bands to have come out of that country. If you're a fan of Swedish bands in general or the first two H.e.a.t albums specifically, then this is an essential purchase. Creye have delivered something special with this release, and they have irrefutably exceeded expectations! This should be in many people's year-end lists, it's certainly near the top of mine!